Traci Lennox is a huge hockey fan, so when a friend asked her to help start a team for injured and disabled military veterans she didn’t think twice. When USA Hockey’s 2016 Disabled Hockey Festival came to Detroit — near her hometown of Livonia, Michigan — she was asked by local rep Carol Schwanger to draw up the scheduling for more than a dozen divisions. She must have had previous experience, right? Now, Lennox is the viewed within the disabled hockey community as the ‘scheduling guru’ when it comes to USA Hockey’s various disabled hockey events. 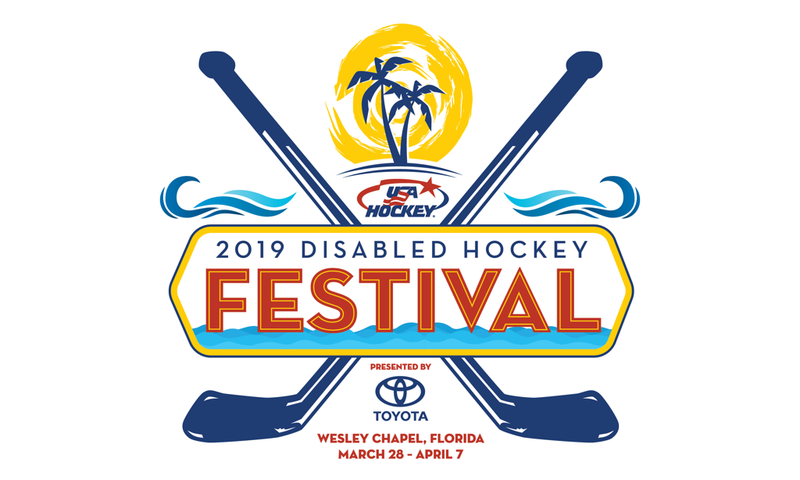 Her talents were on display last week as 40 teams across eight divisions participated in the first weekend of this year’s Toyota-USA Hockey Disabled Hockey Festival in Wesley Chapel, Florida. She has another weekend of games queued up as 64 sled teams are underway this weekend (April 4-7) in both Wesley Chapel and nearby Ellenton. “She’s the Bruce Lee of scheduling,” said J.J. O’Connor, the chairman of USA Hockey’s disabled section who has been helping organize the Disabled Festival for all of its 15 years. Lennox, with the help of a friend who codes, converted the previous style of schedule-making from a handwritten style to something somewhat automated. She uses spreadsheets that take into consideration the different game lengths for the sled, blind, deaf/hard of hearing, standing/amputee, special and Warrior divisions to create the schedules for each tournament. Where O’Connor said it took about 40 hours to come up with the schedule each year, Lennox can now pull the team names from one spreadsheet and select the discipline and number of available ice sheets and produce a schedule within minutes. For the Disabled Festival, Lennox faces a myriad of challenges, whether it’s the amount of ice sheets available, the travel for teams all over the country or even a venues commitment to ice times unrelated to the event itself, the challenge of having only four sheets of ice to schedule games. Sometimes there are late changes, such as a missing team entry, travel delays or roster concerns, which forces her to change the parameters of her scheduling formula, but it has worked out pretty well so far. O’Connor said the Disabled Festival couldn’t function without volunteers like Lennox. The Festival is continually growing and evolving. It originally began with two disciplines and about 30 teams and is now six disciplines and more than 100 teams. For the second year in a row, the Festival has been spread out over two weekends, a plan O’Connor said will remain for the next two years. After that, some disciplines could have their own weekends or multiple cities could be used to not overburden the resources at one site. Each year, the Festival moves to various parts of the country with the goal of exposing new audiences to the sport each year. And volunteers like Lennox help everything run smoothly.